The 11 Best Places to Celebrate St. Patrick’s Day in Illinois! Bustling cities and small towns across Illinois come together each March 17 to celebrate St. Patrick’s Day. Parades are held throughout the state to honor Irish heritage with traditional Irish food, dances, music and more. From dyeing the Chicago River to running in Leprechaun Leap, Illinoisans continue to uphold these St. Patty’s Day traditions. Here are 11 great places to celebrate St. Patrick’s Day in the state. As one of the most popular St. Patrick’s Day activities in the state, the Chicago St. Patrick’s Day Parade has been celebrating Irish heritage for over 60 years in rain or shine. Each year the Chicago River gets dyed green, drawing attention from thousands of sightseers. An annual corned beef and cabbage dinner and plenty of music festivities are part of the event, as well. What better way to celebrate St. Patrick’s Day than partying on a yacht with a DJ? The Green River Booze Cruise provides spectacular views of the Chicago skyline, dancing, freebies, and admission to the after party. The after party is typically held at a River North bar and includes a drink. For a romantic St. Patrick’s Day away from large crowds, the Inn at Irish Hollow is the ideal destination. Here you can stay in a quaint cottage with a stone fireplace and whirlpool spa. This intimate bed and breakfast also offers seasonal dishes prepared from organic produce straight from the garden. As part of the Thom McNamee Memorial St. Patrick’s Day Parade, Banditos Barney’s presents a spectacular firework show over the Fox River each year. The Dundee Scotts Bagpipes kick off “The Most Shamrocklicious Firework Show You’ll Never Forget” and a glow-in-the-dark juggler adds even more wow-factor to the performance. Kids and adults alike can enjoy this after-dark St. Patty’s Day event. Each year thousands of locals gather to watch the floats, marching bands, and other green spectacles at the Springfield St. Patrick’s Day Parade. As the largest parade in Central Illinois, this Springfield tradition features the top marching bands in the Midwest. 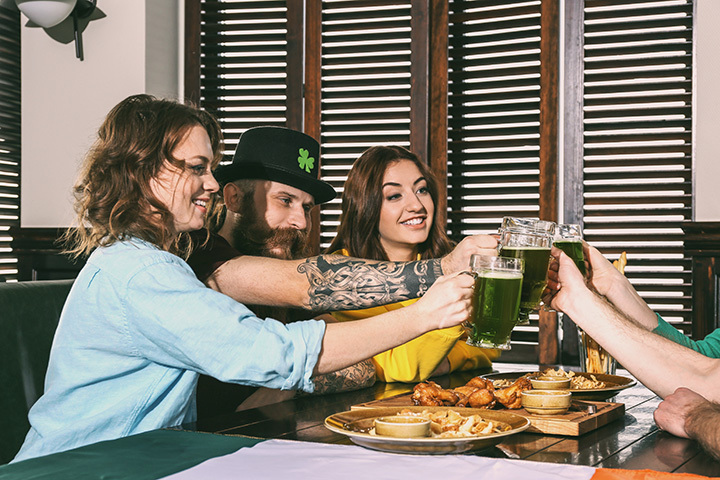 For all you can eat Irish pizza and day-drinking on the outside patio, head to the St. Patrick’s Backyard Bash at The Duck Inn. Here you can sit outside from noon till dusk and enjoy the early spring weather and endless pizza prepared by Chef Kevin Hickey. It’s the perfect spot for celebrating St. Patty’s Day with the huge crowds. Go bar hopping in Wrigleyville at the Chicago Shamrock Crawl. Tickets include a breakfast buffet, green t-shirt, and lots of free giveaways. The Shamrock Crawl hits up all the best bars in Wrigleyville including Old Crow, Full Shilling, Moe’s, and several others. If you love parades, put Elmhurst St. Patrick’s Day Parade on your destination list. This local festivity features Irish dancers, marching bands, animated characters, and over 80 floats. The parade is second largest St. Patty’s Day parade in the Chicagoland area. For small town charm and family-friendly activities, head to the Galena St. Patrick's Day Celebration. Watch the St. Patrick's Day Parade, which features floats, marching bands, local team mascots, and more. This northern Illinois St. Patrick's Day Parade begins at Palombi School and ends on Cedar Avenue at the Train Station. The annual corned beef and cabbage luncheon is held afterward at the Lake Villa VFW hall. There’s never a dull moment at the Irish American Heritage Center’s St. Patrick’s Day celebration. This large celebration draws in thousands of visitors and features Irish step dance performances, contemporary Irish music, food, Irish gifts, children’s activities, and even an arts and crafts fair!